CBD Oil Review rates Canna-Pet with three stars because it qualifies for the Mission, Charity & Innovation Badges. Canna-Pet is a cannabinoid supplement company that makes CBD oil products for cats and dogs that range in price from $17 to $160. Canna-Pet is one of the first companies to create a CBD hemp oil product individually tailored to suit typical house animals that they also infuse with a blend of terpenes and other synergistic compounds. Canna-Pet has taken the veterinarian world by storm, as just like many human beings, more and more animals are in need of cannabinoid therapy. 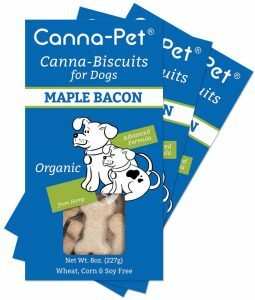 They are one of the few legal over – the – counter pet cannabis products; products come mostly in capsule form, as well as in tasty biscuits that dogs will devour. Canna-Pet reinvests the time, money, and energy required to develop new cutting-edge products that not only support our pets but are something they want to eat. This innovation makes them a highly reputable company to trust with your pet’s wellbeing. If you are looking for Canna-Pet testimonials, then there are over 200 veterinarians who carry and sell their products that would love to share their experiences. Regarding the FDA/Canna-Pet debacle – Canna-Pet made medical claims about what their products could do for your animal – a big no-no for any health supplement company. The FDA cracks down on such violations, and as such sent Canna-Pet a letter which has forced them to transform their approach to marketing their medicinals. The only beef we have with Canna-Pet is the total lack of information regarding the source of the hemp, and no mention of laboratory testing for common contaminants like heavy metals, pesticides, and residual solvents. 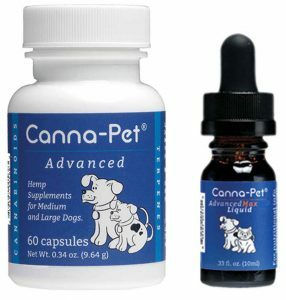 All in all, Canna-Pet stands out as a fantastic choice for all your pets CBD needs. Canna-Pet provides a 50% discount to shelters, fosters and other animal rescue charities. Might Not Be Safe – Although Canna-Pet seems to take a very serious approach to their products, they are not publishing lab results proving the safety. My dog refuses to eat the biscuit. Any suggestion how to make him eat it? Anything for cats?? My girl is 16 and was just diagnosed with bone cancer. Looking forward to giving my thunder/fireworks anxious dog biscuits from Canna Pet. Hope they work. How many Max dosage biscuits per day for a 20lb active Terrier? 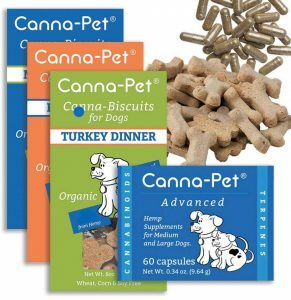 I love Canna-Pet products for my dogs. I also run a rescue and we have several dogs that take the supplements. I have seen a huge decrease in anxiety in dogs when given the supplement, especially the fast acting oil. I do believe Canna-Pet deserves the "Charity" badge because they certainly give back. My rescue, Peace Love & Dog Paws Rescue, works with them and they have donated to our group also. They have helped us raise money, so they are very charitable. Their customer service is the best I've ever worked with. 5 stars from me! The Canna-Pet Advanced Small Capsules have seriously saved my family's cat, Bailey. She suffered from severe gastro issues and could not keep food down. She is also aging and having joint issues and is visibly in pain when she jumps down from chairs and counters. When she takes Canna-Pet mixed in with food 2x a day, it has been a miracle for her gastro and joint issues. She does not vomit and she seems much happier and does not flinch from joint pain. Very thankful that this product has saved my cat (and our rugs!!). My 1-year-old American Bulldog has extreme anxiety issues whenever he rides in a car. I researched every possible solution for this problem and I finally found Canna-Pet! My dog is no longer scared while in a car and actually relaxed now. We can now go on road trips because of Canna-Pet! I've been giving Canna-Pet products to my dog, who is 9 years old, and I've seen amazing results! These products really help with my dog's arthritis and pain. AND what's even better is that my dog loves the biscuits. We love Canna-Pet! My Australian Shepherd Dexter uses Canna-Pet for anxiety and allergies. He had terrible skin conditions from allergies, was even losing fur and chewing his skin. By giving him Canna-Pet I noticed he stopped itching as badly and his fur started growing back! I also use Canna-Pet whenever I travel. People always comment on how well-behaved and relaxed he is. I feel so much comfort knowing I can give him Canna-Pet any time he is about to be in a stressful situation. We love Canna-Pet!! I love this product. I used Canna-pet for my 13 year old Mini-Schnauzer who had diabetes and was blind and it really made a difference for him. I highly recommend it and tell everyone I know about it. My 4 year old rottie has an awful lot of medical problems. He had the worst case of hip dysplasia his first vet ever saw. He had a blown knee which he had surgery on. Just yesterday he had surgery on a torn ACL as well as shattered meniscus. On top of all this the poor guy has pretty awful arthritis in both of his elbows. The vet suggested we give him injections twice weekly to help alleviate the arthritis pain. I don't want him in any pain but i also dont want to inject him with more meds either. He currently takes Tramadol daily to help with pain and I really dont want to add more meds. Has cbd had any positive results with arthritis? He is already overweight, will it cause him to had a bigger appetite? Hes a big guy at 130lbs how much would be recommended for his weight? Oops. Posted wrong place. Yes, give this to your dog. It helps with arthritis & my dog hasn't had a seizure since we started. My 11 yr old rescue Chiweenie starting have severe anxiety daily for no reason. They always started around 4 pm, intensified and started to cause him to refuse his dinner. He was completely checked by the vet, labs, ultra sound, xrays and a dental cleaning that found a bad tooth, which was removed, but the attacks continued. The Vet gave us Trazadone, but it didn't faze him and I was uncomfortable giving him a higher dose. A friend who uses Canna Pet products recommended it and I ordered the biscuits. I gave him one small biscuit around noon although he did have some shaking it didn't last long. On day three the attacks completely stopped. He seems much more playful and is eating all his meals. Will do a trial to see if the behavior pattern has been broken, but will definitely continue to give him these if needed. Great product. I have been buying these for my mom's shitzu, he has seizures and the medicine from the vet is causing liver damage. She was able to cut way down on the vet medicine since taking the canna pet capsules ? I love this product for my dog who is battling cancer. It helped his appetite tremendously and also helped with his vomiting after his chemo treatments.My most recent bottle came about a little over half full. I emailed the their support address and they sent me a reply within two hours. Without any questions asked, the sent me a brand new bottle. Beyond pleased with this product and this company! Hi Ali. How is your dog doing now? We just bought the liquid for our 4yr old pug Ruby who was diagnosed with high grade lymphoma 3 weeks ago. She had 3 chemo treatments so for, We are hopeful that Canna Pet will relieve some of her symptoms and support her through this. We love Canna-pet out 12 year old German Shorthair/Lab was diagnosed with Lymphoma a year ago and our vet said he'd probably be gone in 4 months. He's doing great and even our vet is impressed. Like our vet said he doesn't even know he's sick yet so don't tell him. We put him on Canna-pet CBD pills as soon as we learned of his diagnosis and I think we could easily have him for another year. Still gaining weight and no signs or symptoms of pain.